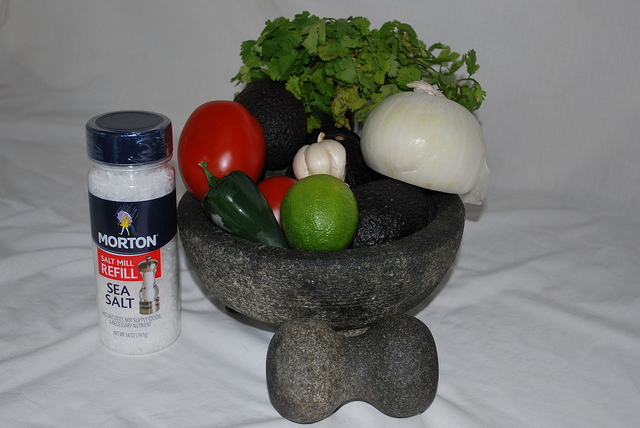 For making our guacamole, we like to use a mortar and pestle. Something about making fresh guacamole in one just makes it taste better. It’s probably just in my head, but I am sticking with what I said. You can do this recipe in a regular bowl, but the mortar and pestle does help to release the flavors and juices. 1 Clove of garlic, minced. A heaping ¼ cup of white onion. 1 Tablespoon of coarse sea salt. ¼ Cup of fresh cilantro. 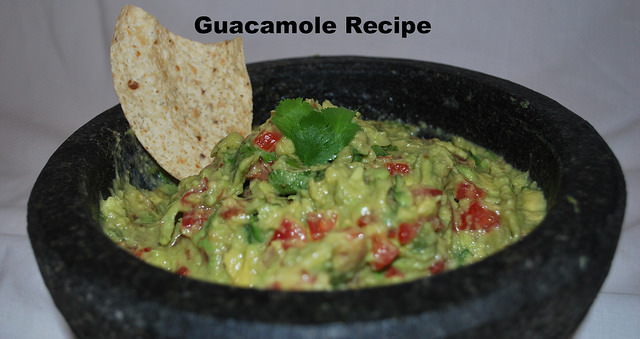 The first step to making this amazing guacamole is to dice up a heaping ¼ cup of white onion and to dice the jalapeno, making sure to remove the seeds from the inside. If you like your guacamole a bit more spicy, you can use a larger jalapeno. You will also want to mince your glove of garlic. If you have read our White Chicken Chili Recipe you will see we mentioned this awesome little GarlicZoom tool that we use quite often and it does a great job at mincing garlic very quickly. 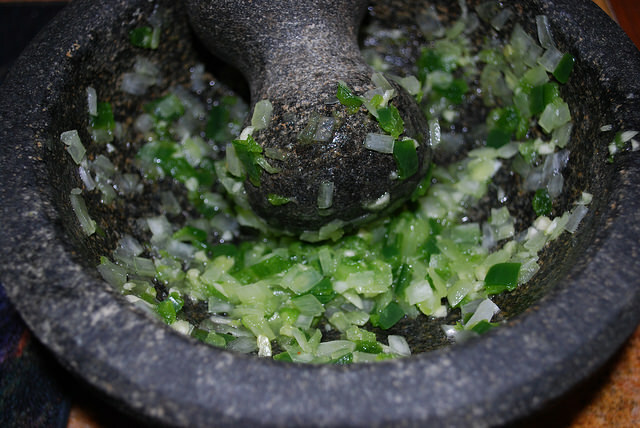 Now, add the garlic, jalapeno, and onion into the mortar and using the pestle, mash it all together (middle picture above). Once it has started to break down a bit, add the juice from the lime. Squeeze as much of the juice out as you can. Then, add in the tablespoon of coarse sea salt. Continue to mash and grind the mixture until you have something similar to the picture on the right. The next part is where it starts to look a little more like guacamole by adding in the avocado. As for cutting up the avocados, I am sure there are a thousand ways to get the avocado out, but we like to halve the avocado by slicing around the outside all the way around. Take a knife and gently tap the blade into the seed, twist and it should pop right out. Then peel the skin off and set avocado aside. 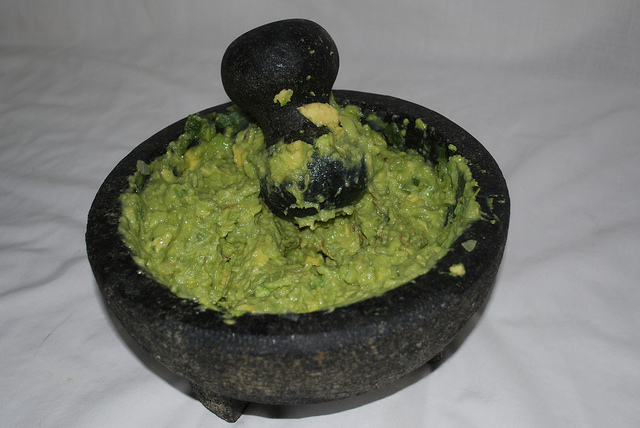 Once you have all of your avocado ready, dice it up and add it into the mortar. 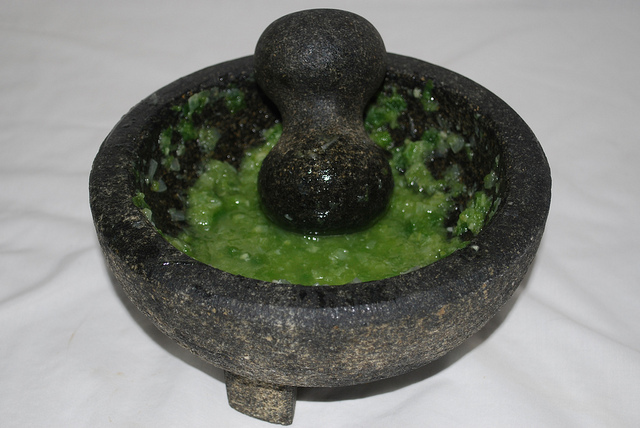 Then using the pestle, gently mash the avocado up, blending well with the mixture in there already. For the next part, cut the 2 plum tomatoes in half and remove the seeds. Then dice the tomatoes up to a size you like. Put them into the mortar and, using a spoon, mix in the tomatoes. Finally, for the last step (and my least favorite part), take the cilantro and pull the leaves off and rip them up right into the guacamole. 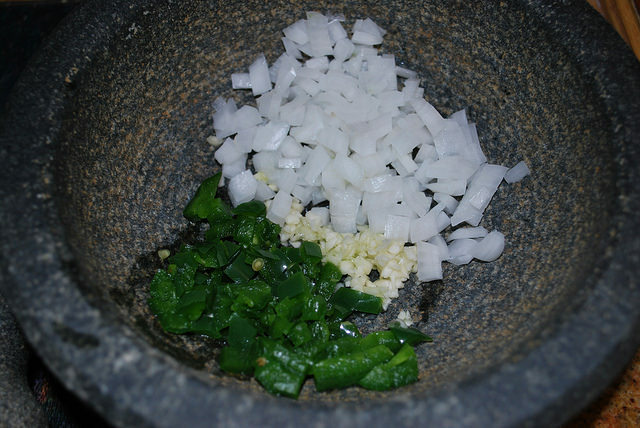 Once all of the cilantro is added, use the spoon again and stir everything together until it is well mixed. 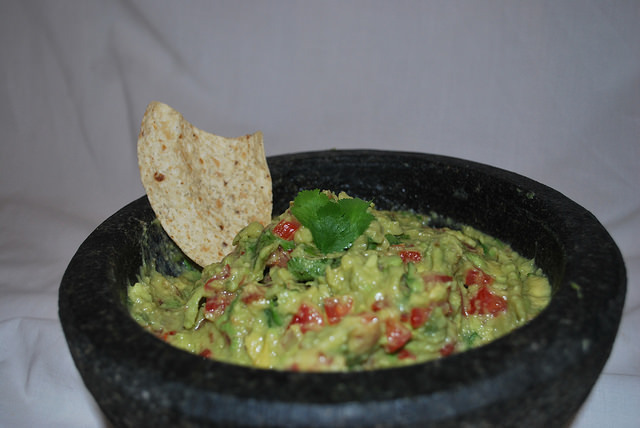 What is your favorite way to enjoy Guacamole? 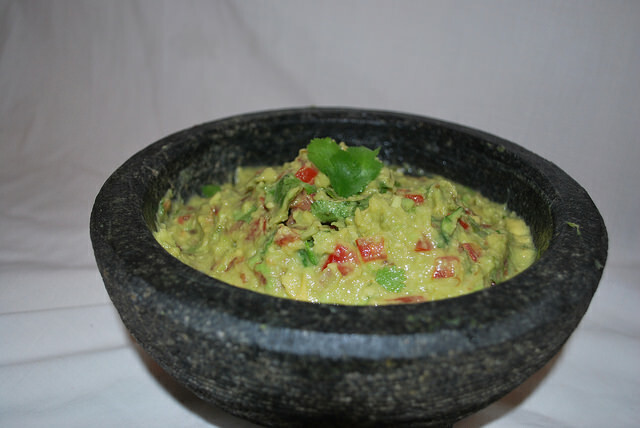 We love making fresh homemade guacamole for tortillas, burgers, and one of ours and our kids favorites, Veggie Tacos. Tagged Avocado, Chips and dip, Guacamole, Tomatoes, Vegan. Bookmark the permalink.